The book has 126 pages. p0-17 is text (all text is in Japanese) and pics of various tessen-like objects. p18-20 has some very improbable-looking elbow locks using your tsuka (while the other guy is holding a sword too) more text, uke-nagashi like deflections of swordcut, a generic scissor technique, p 8-37 has twirling sequences, then forward, reverse, and double handed blocks until p 44. Again some basic locks, scissor and a maki kote gaeshi-like elbow break-control. I don't quite get what comes next, seems to show you can use the stick to reinforce normal empty-hand techniques (strikes, katame waza) p 58 uses stick for shimewaza. Next are very aikido-like techniques with and without stick, nothing spectacular in the stick use. p70 and on uses stick with both hands to deflect tsukis etc. More shimewaza follow. Improbable looking blocks of swordcuts. Around p 90 start some more sophisticated techniques. 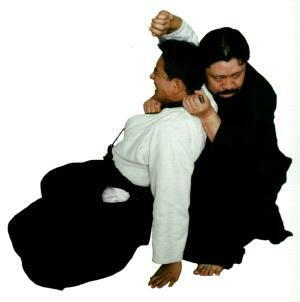 p98 has defenses against wrist grab with your tsuka and with tessen, the usual aikido stuff. p116 has a disarm and control against short stick attacks, more sword disarms, and on p122 they start using the string attached to the tessen. Final technique is tying thumbs together. The techniques in this book use the tessen exclusively as a short stick (actually that is what the techniques are demonstrated with) so don't go imagining any fancy opening sequences to deflect shuriken etc. Personally I like Hatsumi's stick fighting book better (Stick fighting, techniques of self-defense. Masaaki Hatsumi, Quintin Chambers, Kodansha international, 1971). For short stick training, I would also recommend looking at European dagger techniques.